Here’s the thing about sumo knots: whether you know it or not, at one point or another, it’s likely that you’ve worn one. It’s a looped version of a hair knot, of which it gets its name after the way that athletes of the Japanese sport of sumo wrestling wore their hair. The standard top knot, the one you nonchalantly whisk your hair up into on the very top of your head, often takes this form. 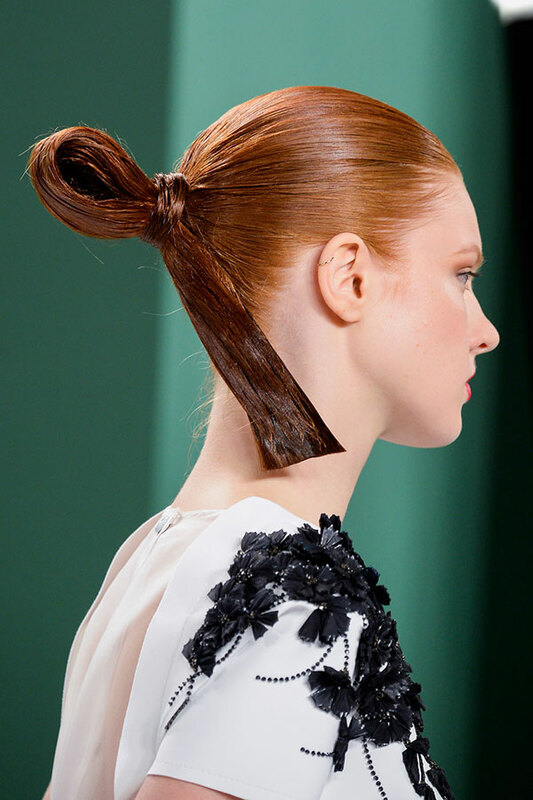 Taking a very literal, editorial approach to the style, the models at Carolina Herrera Spring/Summer 2015 show, wore a version of this knot created by hairstylist Orlando Pita. The runway ‘do is a gorgeous look, for sure, but unless you have some seriously high powered hair spray and maybe even extensions, there’s an easier way to get the look (one of which you’ve probably already created when all you want to do is get your locks off the back of your neck). There’s plenty of ways to score a chic sumo knot—it’s the cool girl hairdo of the moment. Fun fact—a lot of man bun hairstyles also take the sumo knot shape. Looking to give it a shot? All you have to do is take a look at the tips below. Hair that’s less squeaky clean is less likely to slip out, and when it comes to this look which features strands tied in a loop with a hair tie, you’ll have to make sure your hair has some traction. Just washed your hair? Give it some grip with a texture spray, some gel, or a styling powder. Yes, traction and texture, when we’re talking about finish, are two different things. The look used at the Carolina Herrera show is shellacked and shiny, while a messier sumo knot might be one with flyaways and a bit of a deconstructed loop. If you want it to look like you #wokeuplikethis and pulled your hair up in order to wash your face, the latter should work well. The basis of the sumo knot is a ponytail. It’s essentially a ponytail that hasn’t been pulled all the way through. You’ll want to decide if you’re more of a literal top knot kind of chick—in that case you’ll want to secure your pony on the top of your head—or at the center of the back of your head. Create a ponytail. Pull your hair through the band half way through and then secure that loop you just created with the hair tie. To make it less obvious, use a clear plastic elastic instead of a bulky band. Don’t want all your hair on the top of your head? Try a half-knot. When you create the look in a loop shape instead of a bun, which consists of strands of hair coiled in a circular shape, you’ll be wearing a version of the look. Section off the top part of your hair. Start to create a ponytail and pull the hair halfway through the band. This looks really cool when the rest of your hair is in a tousled, beachy wave.